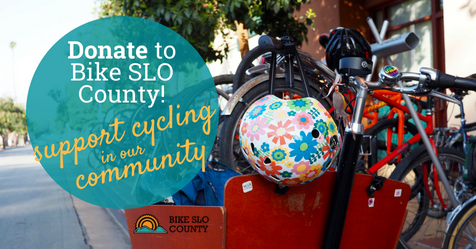 Your generous donation today makes a safer, more bike-friendly Central Coast possible. Your gift not only funds our distracted driving and advocacy efforts throughout SLO County, it helps our core programs like RideWell and the Women’s Program grow in order to serve as many people as possible. Bike SLO County (formerly The San Luis Obispo County Bicycle Coalition) is a 501(c)3 nonprofit organization (Federal Tax ID #75-3021545), and all contributions are tax-deductible. We will never share your contact or payment information. Click 'SUBMIT' and enter payment info on the next page.